G327 is the aftermath of a star that exploded as a supernova. In the composite, X-rays are blue, radio data are red and yellow, and infrared data show the stars in the field. A rapidly spinning neutron star left behind is producing the wind of relativistic particles seen in X-rays. G327.1-1.1 is the aftermath of a massive star that exploded as a supernova in the Milky Way galaxy. A highly magnetic, rapidly spinning neutron star called a pulsar was left behind after the explosion and is producing a wind of relativistic particles, seen in X-rays by Chandra and XMM-Newton (blue) as well as in the radio data (red and yellow). This structure is called a pulsar wind nebula. The likely location of the spinning neutron star is shown in the labeled version. 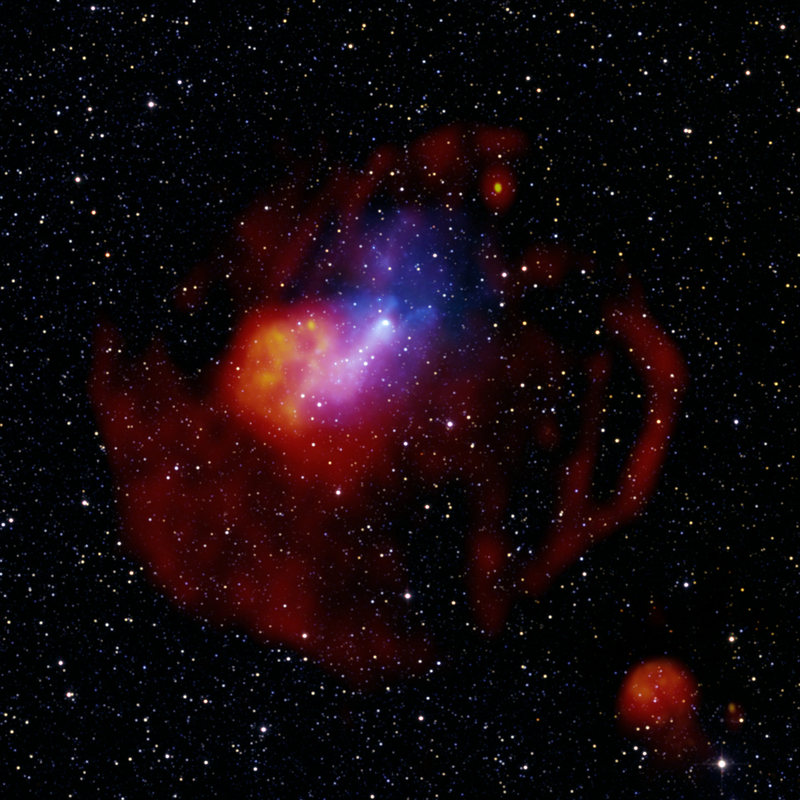 The large red circle shows radio emission from the blast wave, and the composite image also contains infrared data from the 2MASS survey (red, green, and blue) that show the stars in the field. No clear explanation is yet known for the unusual nature of G327.1-1.1, including the off-center position of the pulsar wind nebula seen in the radio data and the comet-like shape of the X-ray emission. One possibility is that we are seeing the effects of a shock wave bouncing backwards off of the shell of material swept up by the blast wave produced by the explosion, the so-called "reverse shock" from the blast wave. The pulsar is moving upwards, away from the center of the explosion, but the pulsar wind nebula is being swept towards the bottom-left of the image by the reverse shock wave that is also traveling towards the bottom-left. The direction of the pulsar's motion and of the reverse shock are shown in the labeled version. The X-ray observations allow scientists to estimate the energy released during the supernova explosion and the age of the remnant, as well as the amount of material being swept up as the blast wave from the explosion expands. The faint bubble that the pulsar appears to be creating may also be revealing the fresh pulsar wind being blown into the region cleared out by the reverse shock. A paper describing these results appeared in The Astrophysical Journal in February 2009 with Tea Temim of the Harvard-Smithsonian Center for Astrophysics (CfA), Patrick Slane (CfA), Bryan Gaensler (University of Sydney), Jack Hughes (Rutgers) and Eric Van Der Swaluw (Royal Netherlands Meterological Institute) as authors. Scale Image is 25 arcmin on a side (211 light years on a side). Coordinates (J2000) RA 15h 54m 25.0s | Dec -55° 04´ 06.0"
Interesting image. It is so asymmetric. Also, you can only see it in x-rays and radio waves, but not visible light. Also, how do you guys even spot these supernovas? Geez, it is 22k light years away. If these pictures are so cool from 200,000 light years from our place, why we can't see closer images from the Moon? When can we see some of this images on 3D? You guys act like this is the first star to explode in the milky way. There are billions of stars in the galaxy. And many of them have already exploded. It *does* look like a trilobite, now that you mention it! The infrared part of the image corresponds to all the little point-like stars. The faint bands you are talking about (red in the figure) are actually radio emission. We believe that this is just part of the patchy supernova remnant shell (on either the front or back side - we can't really tell which from these data). No, this supernova remnant will never reach Earth. It is in the Milky Way, but quite far from us. It would have to expand to more than 100 times its current size to reach us. But well before that its density will have been reduced to that of typical interstellar space. We don't yet know the rotation rate of this pulsar. We're sure, from the structure you see in the image, that the object is a highly-magnetic, rapidly-rotating neutron star. However, its pulsations haven't yet been detected despite rather sensitive searches. It could be beamed away from us, or just be quite weak. We've been surprised at how weak some young radio pulsars are based on observations in the past decade. Thing looks like a trilobite. Great photo using more than one source to reveal structure. Any explanation for the vertical red bands, infrared to the right and below the pulsar Shock waves? Beautiful and an interesting article. Since it exploded in our Milky Way will it reach Earth and effect us? An excellent opportunity to study another type of high energy event. The variety and the different stages of the events are very revealing. Our marvelous universe produces another mystery for us to ponder. What is the rate of rotation for this pulsar? and has a recording of its signal been made yet? It would be interesting to be able to listen to it. 29,000 light years from Earth. 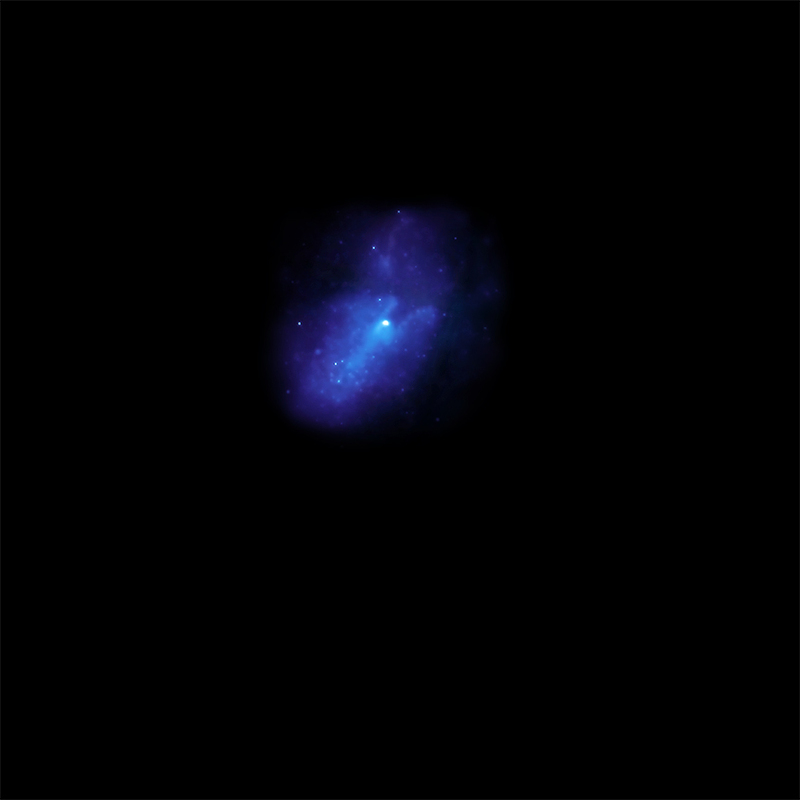 X-rays from Chandra & XMM-Newton were combined with radio data and infrared data. 211 light years on a side. X-rays are shown in blue, radio in red and yellow, and the infrared shows the stars in the field.